Split ends are one of the common hair problems faced by most of the women across the world. Due to many factors like hair styling products, lack of nourishment and less moisture, the protective layer of the cuticle wears off. This leads to single or multiple slits at the end of the hair. Women with frizzy and dry hair are more prone to develop split ends. The best ways to remove split ends is to trim the hair. If they are left untrimmed, then they continue splitting along the hair and eventually you will lose the hair strand. Once, you have trimmed, you can try home remedies regularly to prevent the recurrence of split ends and improve the hair strength. 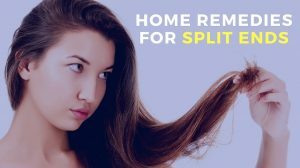 How to Get Rid of Split Ends at Home? There are several home remedies to prevent split ends. For your convenience, we have listed the best 18 methods below. Eggs are a rich source of protein and fatty acids. As our hair is made of protein, eggs help to strengthen the protective layer present around the cuticle. The essential fatty acid makes the hair smooth and less prone to breakage. Separate 1 egg yolk and whisk it. Add 2 – 3 tablespoons of olive oil and 1 tablespoon of honey into it. Mix well and apply it to the damp hair. Alternative Method: Whisk 1 egg with 1 teaspoon of almond oil. Apply it to the hair and rinse it off with shampoo and water after 30 minutes. The enzymes, vitamins, and minerals present in papaya reduce hair thinning, reduce chemical buildup and adds shine to the lifeless hair. Chop a fully ripe papaya into pieces. Into a blender, add papaya pieces and yogurt. Blend them to get a pulpy paste. Castor oil is rich in vitamin E, minerals, proteins and omega fatty acids which are helpful in maintaining the hair healthy. The ricinoleic present in castor oil increase the circulation to the scalp and strengthens the hair roots. Combine enough amounts of castor oil, mustard oil, and olive oil. Massage the mixture on the scalp and along the hair (concentrate more the hair ends). Wrap the hair with a towel or shower cap. The proteins and nutrients present in beer moisturize and nourishes the hair. It also removes buildup of impurities from the scalp. Dark beers provide better results than light colored beers. Rinse with water after leaving it for a minute. The fatty acid content present in avocado deeply conditions the hair. The protein, folic acid, magnesium and vitamins present in it nourish the hair and prevent split ends. Mash the pulp of 1 avocado. Add 2 tablespoons of olive oil and coconut oil to the avocado pulp. Mix well and apply it to the along the hair liberally. Conditioning with hot oils helps to restore the moisture content in the hair shaft. This helps to prevent the hair splits. You can use any natural oils for this process like castor oil, coconut oil, almond oil or any other. Slightly warm up any natural oil. If you are using a microwave, then set the time for 20 seconds. Massage the warm oil onto the scalp and along the hair. Leave it on for at least 45 minutes. Bananas are rich in potassium, zinc, iron and vitamins which help to maintain the elasticity and reduce the breakage. Apart from that, they encourage hair growth and repair the damage. Mash 1 fully ripe banana. Add 2 tablespoons of plain yogurt, a little amount of rosewater and lemon juice to the banana pulp. Apply the mixture along the hair. The humectant property of honey locks the moisture content to maintain the hair hydrated and moisturized. This makes the hair smooth and split free. Combine 2 tablespoons of honey in 4 cups of water. Again rinse the hair with honey solution. When milk is combined with cream, it provides enough moisture to the hair making it soft and supple. The proteins present in milk encourage tissue repair. This, therefore treats split ends. Add 1 tablespoon of cream to 1 1/2 cup of whole milk. Rinse your with the mixture. The hydrating nature of aloe vera moisturizes and hydrate the hair. It also reduces hair loss and encourages hair growth. Massage aloe vera gel onto the scalp and hair. For added benefits: You can add lemon juice, castor oil, olive oil or jojoba oil. Rinsing hair with chamomile tea is one of the effective ways of treating split ends and frizzy hair. Brew enough amounts of chamomile tea. Rinse your hair with the brewed chamomile tea. Repeat the process regularly to liberate the hair from split ends. The fatty content and moisturizing properties of shea butter create a protective layer around the hair shaft. This prevents split ends and frizzy hair. Massage your damp hair with shea butter. Repeat the process regularly for few days to notice the results. Note: You can use cocoa butter instead of shea butter. Argan oil is one of the best ways to treat a solace of hair problems including split ends, dry hair and frizzy hair. Massage the oil gently onto the scalp and along the hair. Leave it on for 30 minutes or overnight. This is an amazing DIY hair mask which provides essential nutrients to the hairs, creates a protective layer around the cuticle and prevents split ends. Blend 1/2 cup of black lentil powder and a tablespoon of fenugreek seeds into a smooth powder. Combine the blended powder with a cup of yogurt. Apply this mixture along the hair and leave it on for 2 hours. Wash the hair normally with shampoo and water. Vitamin E oil not only provides nourishment to the hair but also creates a barrier around the cuticle to prevent split ends. Add the contents of 2 – 3 vitamin E capsules into enough amounts of lukewarm water. Massage the mixture onto the scalp and along the hairs. For this process, you can use either white vinegar or apple cider vinegar. The acidic properties of vinegar balance the pH levels of the scalp. This helps to ward off scalp infections and encourage healthy hair growth. Combine 1 part apple cider vinegar and 1 part of water. Rinse your hair again with this solution. The deep conditioning properties of yogurt help to hydrate and moisturize the hair which prevents the split ends. Mix 2 – 3 tablespoons of yogurt and 1 tablespoon of honey into a paste. Let the application rest for 30 minutes. Essential oils are one of the most effective ways of treating split ends. They condition the hair, stimulate the hair follicle, repair the split ends and prevent damage. You can use any essential oil for this process like morocco oil, lavender oil, cedarwood oil, rosemary, peppermint or lemon essential oil. You can either one or combination of different oils for split ends treatment. Combine any essential oil and carrier oil like almond, olive or coconut oil. Massage the oil mixture on the scalp and along the hair. Note: To ensure you aren’t allergic to any essential oil, it is better to perform a patch test. Spits ends can also be caused by lack of nourishment. Proper nutrition not only helps in preventing the split ends but also improves the health of the hair. Let’s have a look the important things you have to include in your daily diet. Biotin: Deficiency of biotin is one of the reasons for dry, brittle and fragile hair. So include biotin-rich foods like Eggs, almonds, milk, meat and whole grains in your daily food. You can take biotin supplements as well. Vitamin C: It is the most important factor to boost the collagen which helps in hair growth. Vitamin C rich foods include oranges, lemon, kiwi, strawberries, and grapefruit. You can also opt for vitamin C supplements. Vitamin A: Vitamin A is very helpful in boosting the immune system which wards off bacteria causing infections. Foods rich in vitamin A are carrots, dark leafy greens, sweet potatoes and dried apricots. Alternatively, you can take vitamin A in supplement form. Omega Fatty Acids: They contain many essential properties which are very important for healthy hair growth. Foods rich in omega fatty acids include tuna, salmon, sardines and flaxseeds. You can opt for fish oil supplements for omega fatty acids. Selenium: It is helpful in treating and preventing scalp infections. It also helps in healthy hair growth. You can selenium content in Brazil nuts, beef liver, chicken, tuna, and turkey. Opt for selenium supplement if you want. Limit the usage of blow dryers, straight irons or any other hair styling product. If you use a hair dryer to dry your hair then use it at cool setting. Avoid rubbing towel to dry your hair. Apply Vaseline to the hair ends and leave it for 30 minutes. Wash your hair normally with shampoo and water. Avoid brushing your hair while wet as it can lead to breakage. Remove the tangles in your hair with a wide-tooth brush. Never brush your hair vigorously as it can damage your hair texture and lead to damage. Cover your hair with a hat or scarf to avoid the damage caused by harsh sun rays. It is better to avoid or limit using chemicals based creams to treat split ends. Drink plenty of water to keep the scalp and hair hydrated. Trim your hair in every 3 – 4 months. Did this article provide the information you have been looking for? If you have any queries or suggestions, write to us in the comment section below.